In 1851, the Oatman family embarked on a long journey to California to find a better life. When they entered the Arizona Territory, the Oatmans and other members of their party met with all kinds of difficulties. After their supplies were about exhausted, some in the group decided to stay in Tucson, but the Oatmans and a couple other families decided to push on. Here is a link to a post I did about the massacre. 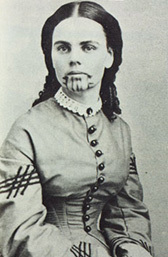 In the late 1800’s, in the Black Mountains of Mohave County, Arizona, and near where the current town of Oatman is located, Olive Oatman was rescued from the Mohave Indians who acquired her in a trade from the Apache. In honor or this brave girl, the town was named after her. The town started as a small mining camp with a few tents scattered about. In 1915, two miners struck it rich with a gold vein worth around 10 million dollars. 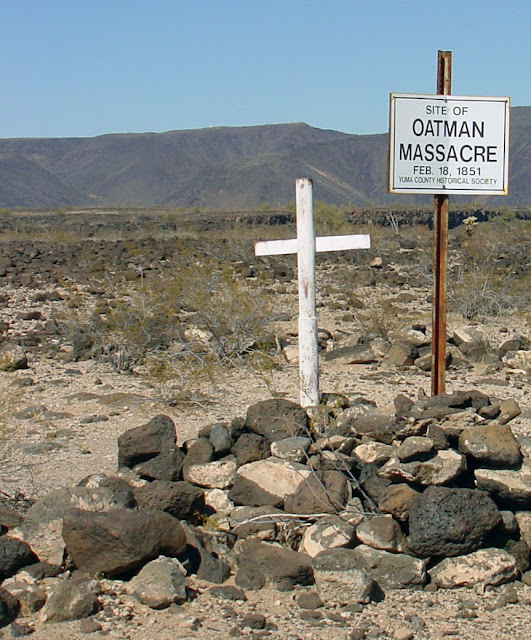 Within a year, the word got out and Oatman’s population hit over 3,500 people. In 1921, the town met with disaster and most of the town’s buildings were destroyed by fire. Luckily the Oatman Hotel survived the fire’s rage, but the majority of the town was gone. Three years later in 1924, the United Eastern Mines and the town’s major employer, shut down the mine for good. By 1941, because other cheaper metals were used for the war materials, the U.S. Government had the rest of Oatman’s mines cease all operations. With the entire settlement’s mine closed you would think this would be the end for Oatman. It was Oatman’s location along Route 66 kept the travelers passing through the town. Oatman enjoyed the traffic and visitors, but in 1953 a new highway was constructed and the entire town was bypassed. 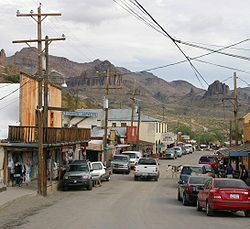 By the 1960’s, Oatman was almost empty and looking much like a ghost town. Today, because of its history and the growth of nearby Laughlin, Nevada, Oatman has been revived and visited by many tourists. Roaming around the streets of the town are wild burros that are rumored to be descendants from the pack animals let go by early prospectors. These burros are protected by the U.S. Department of the Interior. People are told to be cautious around the donkeys because they are wild and who knows what they might do if provoked. Weekends in Oatman, visitors are entertained by Wild West shootouts, and many other celebrations. The town celebrates the Route 66 location with “Route 66” signs all over the place and souvenirs for the tourists. One of the things you will notice while visiting the Oatman Hotel is all the one-dollar bills on the walls and ceiling of the bar and restaurant. The say there is thousands of dollars adorning the inside of the hotel. Interesting post! 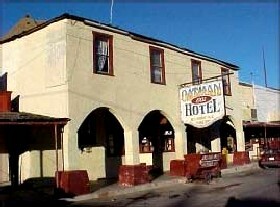 My wife would love to visit/ stay over at a hotel like the Oatman! Wow, that's a TON of one dollar bills. Sounds like yet another excellent birthplace for a scary story. Yep, it has all the makings of a scary movie. I am going to have to see this place for myself. Sharon just did a 666 post hmmmmm? Yep, we are feeling a bit devilish today, lol. Just got back from Oatman (3/14/2016) the burros were in full view, right smack in the middle of the street looking for handouts which were abundant by visitors. The little town was VERY crowded and seems popular with motorcycle riders. Lots of touristy shops selling typical T shirts and magnets (reminds me of Calico in Barstow) If you look past the commercialism, this is a really interesting place, it's a "living" ghost town with some active gold mines in the area....yes, "active"...they are still pulling gold out of the mountain. Lots of neat old "shacks" showing how the hardy minors lived almost a century ago. It seems most of the area is closed for looking off the beaten path, I assume it's full of open mine shafts and private property but it's worth the 45 minute drive from Laughlin if you want to get away for a few hours. I did not see any ghosts but again, the place was packed with travelers. Perhaps during the week, when the place is quiet the sprits of yesterday may come out and play.